I decided to found a new OSB in the Menzel 3 system. Because I want to have easy access to Ceres LM I wanted it close to the Ceres Gate. I have enough SC to build it, so I made my first attempt at a distance of about 250km from the gate, which according to the AP was the closest structure. I got a message 'Another settlement is too close (within 200km)'. So i moved further away... got the same message. I have now got to 2.0Mm from any structure and I'm still getting this message; see image. I get the same message in version 1.4076 and 1.5008. I have suffucent SC to perform the build. My ship has 0m/s velocity and the Grav Anchor is ON. My ship is at least 200km from any structure as listed in the AP. 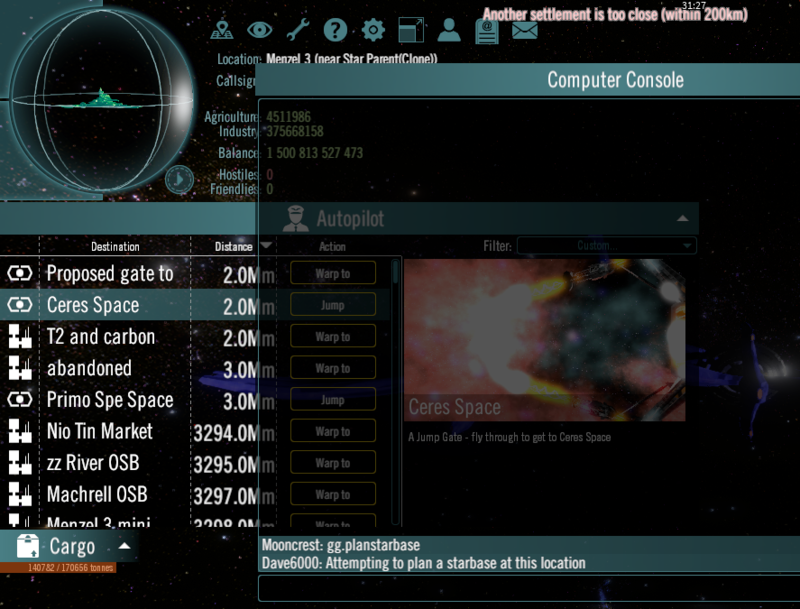 AP filter shows Starstations, Jump Gates, Colonies and Starbases. The OSB I wish to created is not to be linked to a colony, but he build gets rejected before the 'link to colony' reminder message appears. I have created an OSb in Deep Space before, so I know it is possible to have an OSB not in a planet's gravity well. I have seen OSBs within a stones throw of a Jump Gate before, so I know it is not the Jump Gate that the message is referring to. It has been a while since I last built an OSB so I may have missed something. I'd just like to know what. Last edited by Mooncrest on Fri Jul 27, 2018 8:37 am, edited 1 time in total. I have moved the build site to a point 12Mm from Rocky Planet (17) and managed to start my new OSB. Perhaps you do need to be within the Gravity Well of a planet to build an OSB afterall. Mooncrest wrote: I have moved the build site to a point 12Mm from Rocky Planet (17) and managed to start my new OSB. That is something we should watch for. I planned one in an Asteroid field once, but it did have planet grav that it was locked to. When I was trying to build OSB close to jump in point, for the same purpose, it seemed like it only checked the distance from the the sun. So the distance from the sun had to be at least 200km different from all other OSBs that are gravity ancered to teh sun in MZ3. Which means there could be an OSB already placed at where you jump in, blocking the posibilty to build another. But jump in point seems not to be in line with OSBs, so the distance from jump in poin top closest OSB is still way more than 200km. It seemed to me like all OSBs are in a line, just with diffferent distance to the sun. PLacing an OSB away from the line, just makes the OSB jump back to the line next time I jump into MZ3. Not sure if that is understandable, a bit difficult to explain my observations. I have only seen this in MZ3 when sun is gravity acnher, have not tested similar on other locations. RAM wrote: That is something we should watch for. I planned one in an Asteroid field once, but it did have planet grav that it was locked to. Astroids have no gravity in this game, so OSBs need to be gravity-locked to a sun, GG, RP or moon (not 100% sure about if moons work). All unlinked OSBs need to be gravity-locked to something, not sure if linked OSBs are different.